Welcome to November's installment of the Winter Project Link Party! This is a link-up, or blog hop, where others can join in and share the projects they are working on this winter. I'll go first, sharing with you my latest blanket project. I call it Hensfoot, after my two lovely little hens and their sweet feet, but it's actually made with a crochet pattern called Larksfoot. If you look closely at the stitch pattern, you'll see why: the clusters have a little "toe" at the bottom which dips down into the row beneath it. I was drawn to this design as soon as I saw it a few months ago and I knew it would be just right for my newest afghan. I'm still enjoying this project very much, but I haven't made heaps of progress this month. I think I've added about eight inches of length, though, which is not too shabby. Hensfoot is about 24 inches long now, and covers my whole lap as I work on it. I always look forward to the point when this happens in any blanket project. As I've mentioned before, crocheting a blanket and having it grow to cover my lap as I work has become the highlight of my winter these past few years since I began crocheting seriously. I think this is my fifth winter of earnest daily crochet, and this will be my sixth (or maybe my seventh?) big blanket. As much as I enjoy working on it, I've put Hensfoot aside here and there so that I can get a start on some crocheted holiday gifts. I think I was too ambitious about the number of gifts I planned to make; my imagination ran away with me, I guess. Some of them probably won't happen, but that's okay. I don't like to pressure myself; gift-giving should be happy and fun, not a chore. So I'll finish what I can; there are always other things to give as gifts. I've noticed that my yarn basket is becoming easier to carry nowadays. Back in September when I first started this project, the basket was so chock-full of yarn cakes that I couldn't grasp both handles in one hand! I had to lug the basket around like a bushel of apples. Yarn cakes would fall over the edge in a trail on the floor as I went. I've used a lot of yarn already, but there's plenty more, cakes and cakes of it. I think this blanket has the potential to be my biggest ever, which is just fine with me. It's a stashbuster and who doesn't enjoy a huge blanket to use on the couch? Or to build a tent with? Or to lie on with a book in the backyard? Nobody at my house, that's for sure. Your blanket's looking lovely, I do like the stitch you're using and the colours too. I'm really pleased that my own blanket's growing now, it's become much cooler here lately so it's good that it keeps me warm whilst I'm working on it. oh how lovely hun!!! looking forward to popping back to see all the projects shared. its all summer here on our side of the world - so the catch up with your winter projects will give me inspiration for the cooler months to come (a little later!) *chuckle*. Thank you very much for your project. It´s great idea. I like your blanket a lot. You chose amazing colors. 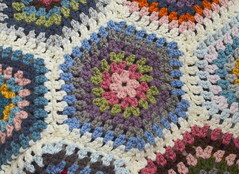 I like the colours you're using for your blanket, they all go really well together. I'll be joining in again with the link up party in the next few days. Thanks again for organising it. Have a lovely weekend! Your blanket is beautiful Jennifer. I'm afraid mine hasn't grown much at all this month...but I've made lots of other things this month, including another blanket! Have a lovely weekend my friend. It's looking wonderful. I love the idea of a project keeping your lap warm :). I love that hens foot stitch Jennifer. If I didn't have two blankets on the go I'd start one just like it. I'm sorely regretting starting a blanket with so many ends to weave in as well as joining squares together! Ugh! Now that is looking good and the colours are perfect too. 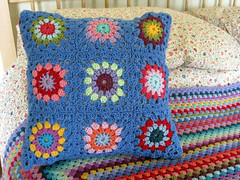 You have so much experience with crochet projects, the shades you choose and the style of your crafts seem always so perfect Jennifer! Your blanket looks so nice! A big blanket is the best to snuggle up in. 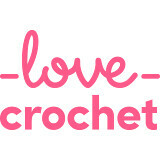 Unfortunately, I never learned to knit or crochet, but I love seeing everyone else's beautiful work! It makes a house, a home, doesn't it? I really like the colors of your blanket. Not much crochet practice this week. I wasn't in the mood for much more than day dreaming and watching Criminal Minds. Stash busting blankets give you such a wonderful blend of colours. Love the warm tones in your blanket so far. It's looking amazing! Your blanket looks amazing! 8 inches is a lot of length to add when you also need to wear many other hats in a family life. You will love it so much when it's done - keep up the great work and thanks for hosting a fun place to keep us motivated! Your blanket looks fab Jennifer. Gorgeous autumnal colours. Yaay I'm here! I fear that I'm too late for last Friday and too early for this Friday but I'm here nevertheless. Thanks Jennifer. x Love your blanket to bits. That is one great blanket! I have grand plans to attempt a crochet blanket, but, not right now. Great linky, there are some interesting projects on the go. I'll have to try and post some stuff we are working on. I love your blanket. The colours are so beautiful. Your hensfoot blanket is coming on. So true how the workbasket changes as the project goes on. Almost like your packing is improving! I'm working on a quilt at the moment. Top done. Hand quilting about to commence. I must remember to link up next month.